Our team focuses on two aspects, one is macro strategy including how to build, what to build, when to build and what unit we should train and when to train, the other is micro movement including when to retreat, which enemy one unit should attack, units movement and terrain judgments. Both aspects are flexible and we designed a simulation schema which can provide evaluation information for AI to decide what to do next. I’m the leader of Flash team. 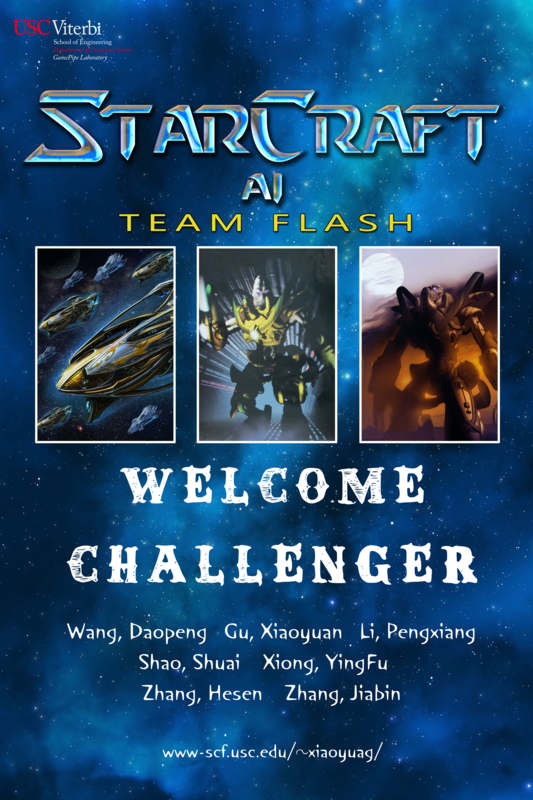 I have over 3-year experience of playing Starcraft I. Since I’m familiar with Starcraft I, I’m in charge of all macro strategies and decisions used in Flash bot. The basic strategy of Flash bot is reacting to the enemy’s decision. Flash bot uses many heuristic functions to make decision of expansion, training units, upgrading and etc. I mainly focus on the micro movement strategies. Specifically, implement the hit and run movement of Dragon (a type of ranged units), modify units movement near the edge of terrains and within area where have lots of buildings, Test and fix movement bugs of all units. Maintain the team website. Implemented API for basic information, evaluation, and estimation for both enemy and AI. Provided action suggestion for AI. Responsible for global design and management of the micro part of AI. In detail implemented the army formation module, the base defense module (especiallly against rush), the squad arrangement module and the scout defense module. Meanwhile participated in designing other modules in micro part, such as concentrated fire, fighting strategy and retreating strategy. Map Information analysis, providing value estimation for every region, thus providing optimal region to regroup, defend or build. I'm in charge of the all worker and building intelligence, including but not limit to: rebalance worker in different expansions, building position and distribution around different expansions and build cannon to defend based on a time seried model. Copyright © 2016 Xiaoyuan Gu.